Please join us for a talk by Moishe Postone, the Thomas E. Donnelley Professor of History at the University of Chicago, on the Holocaust and anti-Semitism. On the basis of a reading of Marx’s social epistemology, Dr. Postone will seek to differentiate antisemitism from other racisms in ways that both explain the ideological frame necessary for the Holocaust and indicates why anti-Semitism poses a particular challenge for the Left. This talk should be of special interest to students of European and intellectual history; social theory; and Jewish studies. Thursday, February 28 in the Scheuer Room. The event will begin at 4:30 p.m. with an introduction by President Chopp. 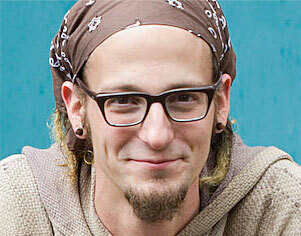 Shane Claiborne is a star in the world of Christian peace activism. He is the author of several books including The Irresistible Revolution, Jesus for President, Becoming the Answer to Our Prayers and with Tony Campolo, Red Letter Revolution: What If Jesus Really Meant What He Said? Sponsored by the Religion Department, Interfaith Center, Lang Center for Civic and Social Responsibility, Peace and Conflict Studies, Swarthmore Progressive Christians. View or download a flyer. War News Radio at Swarthmore College will be holding an interest meeting this week on January 29 at 7:00 p.m. The meeting will be held in Lodge 6. See the map below. Read more about War News Radio on their website!. An investigation of education as a cultural event that engages issues of identity, difference, and power. The course explores a set of key tensions in the contested areas of multiculturalism and multicultural education: identity and difference; peace and conflict; dialogue and silence; and culture and the individual psyche. Students will apply theory and practice to global as well as specific, localized situations — communities and schools that contend with significant challenges in terms of equity and places where educators, students, and parents are trying out ways of educating for diversity and social justice. Fieldwork of two to three hours per week. Prof. Cohen explains that the course emphasizes multiculturalism and the study of power as central to education, peace, and justice. We examine these tensions in terms of a range of conceptual frameworks which point to such matters as the issue of power in pedagogy and curriculum; the role and problematics of dialogue in teaching and learning; and the challenges and promise of addressing conflict, e.g. ethnic and religious tensions, and promoting peace via education. We apply theoretical constructs to broad as well as specific, localized situations — communities and schools that contend with significant challenges in terms of equity and where educators, students, and parents trying out ways of educating for diversity and social justice. The class meets Monday / Wednesday 2:30pm-4:00pm. What a great way to start the spring semester, with Peace and Conflict Studies folks featured on the front page of the college website. 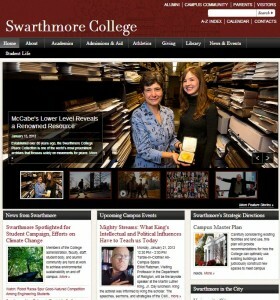 The main banner photo shows Swarthmore College Peace Collection curator Dr. Wendy Chmielewski and Miriam Hauser ’13 displaying Jane Addams’ 1931 Nobel Peace Prize Medal. The full story is reproduced below. 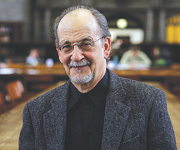 You will also notice the distinguished visage of Prof. Elliot Ratzman over an announcement that he will be the keynote speaker at the annual Martin Luther King, Jr. Day luncheon on Monday January 21, 2013 at 12:30-2:00 in Tarble-in-Clothier. He will speak on, “Mighty Streams: What King’s Intellectual and Political Influences Have to Teach us Today.” The full text of the event description is also reproduced below. Read the story on the News and Events website. 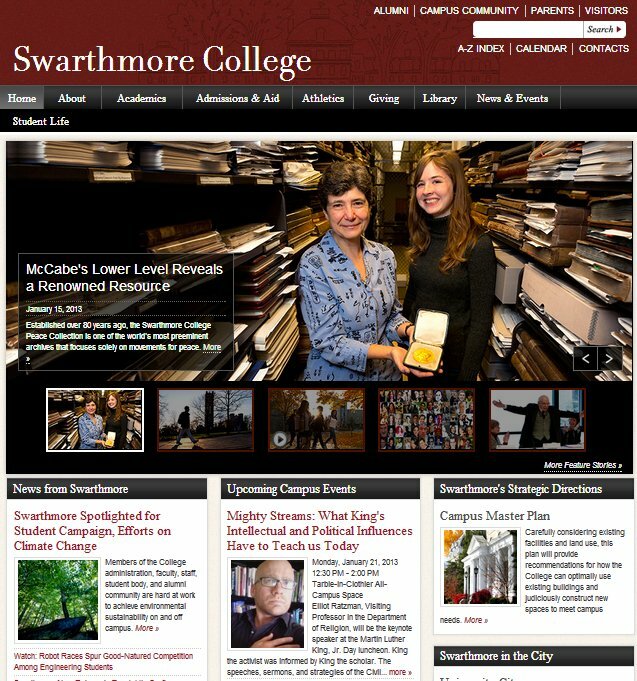 While McCabe Library may be most familiar to the students whose thesis carrels are found there, it also holds a world-renowned but less wellknown treasure – the Swarthmore College Peace Collection (SCPC). Housed within the lower level and basement of the library is an extensive collection of books, manuscripts, photographs, posters, audiovisual items, bumper stickers, buttons, flags and other ephemera that documents “non-governmental efforts for nonviolent social change, disarmament, and conflict resolution between peoples and nations,” according to their mission statement. Established over 80 years ago, the Peace Collection is one of the most extensive research libraries and archive collections in the country that focuses solely on movements for peace. Wendy Chmielewski, the Collection’s George R. Cooley Curator, and Miriam Hauser ’13 look over materials in the Swarthmore College Peace Collection. In 1930, Jane Addams, the prominent internationalist and founder of Hull House in Chicago, visited Swarthmore for the 300thanniversary of the founding of the state of Pennsylvania. During her visit, Addams met with Frank Aydelotte, the president of Swarthmore College from 1921 to 1940 who is famous for implementing the College’sHonors Program as well as helping to strengthen its liberal arts education and to elevate the intellectual and student life on campus. “He was interested in developing a library on internationalism for the students and faculty,” says Wendy Chmielewski, the Collection’s George R. Cooley Curator. Thoroughly impressed with Aydelotte and the College, Addams bequeathed her extensive collection of personal books on issues of peace and internationalism as a contribution to the library. The collection, though, had been unofficially developing over the years before Addams’ donation, as the College began accumulating records from the Women’s International League for Peace and Freedom(WILPF) – an organization of which Addams was the first international president. After Addams became the first U.S. woman to win the Nobel Peace Prize in 1931, the collection began acquiring more and more documents from Addams, including personal letters and even her Nobel Prize medal. The WILPF continued housing all of their records, making it one of the largest collections in the library. Jane Addams’ 1931 Nobel Peace Prize Medal, above, is part of the Peace Collection. The millions of documents and items stored in the collection represent a wide array of peace-related topics, dating back to 1815. “We collect mainly on religious and secular pacifism, disarmament, [the] anti-nuclear movement, conscientious objection, nonviolence, [the] civil rights movement, the anti-Vietnam war [movement] and the current anti-war movement,” Chmielewski says. Other main collections include issues of anti-militarism and even a collection of letters written by Mohandas Gandhi. The collection originated with a strong emphasis on women’s rights and women’s involvement in the peace movements – an emphasis that is still strong today. “Fifty percent of what we have here is about women’s public role, not just in the peace movement, but in social movements in general, from the 19th century onwards,” Chmielewski says. Chmielewski, who has been working at the Peace Collection for what she deems “many, many years,” knows the collections, their stories, and the thousands of items like the back of her hand. When she first joined the SCPC, the College had received a grant from the Ford Foundation to organize all the collections on women into a guide, which allowed her to familiarize herself with the many peace organizations founded and fostered by women. As one of the larger collections, the WILPF records include a bevy of documents, photographs, correspondences, publications, and audiovisual aspects that have been collected since 1915. Other women’s groups represented in the collection include Code Pink, Women Strike for Peace, theWoman’s Peace Party, Another Mother for Peace (a group that opposed the Vietnam war), and the World War II-era Women’s Committee to Oppose Conscription. The collection also highlights individual female peace activists who were involved not only in the woman’s suffrage movement, but also in anti-war and anti-nuclear efforts. One such collection is that of Mildred Lisette Norman, better known as Peace Pilgrim, who walked over 25,000 miles across the U.S. promoting global, national, and inner peace. Her papers consist of pamphlets, writings, and news clippings, as well as her tattered shoes, comb, and toothbrush – the few things that Peace Pilgrim carried on her travels. Memorabilia from Code Pink, such as this cup with anti-war messaging, is also a part of the Collection. As the only collection in the country that focuses solely on peace, the SCPC attracts scholars from all over the U.S. and the world, including the United Kingdom, Germany, Japan, France, and Canada. Graduate students use the records for their theses or Ph.D. work, while another portion of the collection’s visitors are undergraduates and the general public. The SCPC also maintains a close connection with Swarthmore’s Peace and Conflict Studies program (Chmielewski is a member of the program’s oversight committee) and provides materials for databases such as the Global Nonviolent Action Database, spearheaded by visiting assistant professor George Lakey and his students. Another recent use of the Peace Collection’s holdings can be found in the work of Duyen Nguyen ’13, a Wichita, Kan., native and political science major, and Alison Roseberry-Polier ’14, a gender and sexuality studies and history double major from New York City. They dedicated their time last summer to the expansion of an online database that identifies female candidates who ran for office before 1920 – and thus before the 19th Amendment which allowed them to vote was ratified. Called Her Hat Was in the Ring!, the database features biographies for several little-known women involved in the political process of the early 20th century. Their work was supported by Tri-Co Digital Humanities, an initiative committed to discovering and promoting digital literacy and innovating through humanities-based inquiry using new technology. Though the Peace Collection is mainly utilized for research purposes, it also has its eclectic side, with unique items such as banners from women’s suffrage marches, photographs of the Vietnam War, anti-war bumper stickers, a piece of the Soviet missile destroyed in Saryozek in 1988, and even a small portion of the Berlin Wall. The online database, Triptych, provides digitized versions of over 1,700 buttons, pins, and ribbons from peace organizations over the last 130 years, as well as many other items. The Peace Collection hosts a variety of lectures and exhibits with McCabe Library and the Friends Historical Library, such as last year’s exhibit on Bayard Rustin, a peace activist and organizer of the 1963 March on Washington, and a recent lecture about Roy Kepler, founder of Kepler’s Books in California and a prominent member of the public radio station KPFA. Chmielewski also hopes to host an event commemorating the upcoming 100th anniversary of WWI. With its historical treasures and materials, the Peace Collection offers up a distinctive slice of national and international history on peace and social justice. Elliot Ratzman, Visiting Professor in the Department of Religion, will be the keynote speaker at the Martin Luther King, Jr. Day luncheon. King the activist was informed by King the scholar. 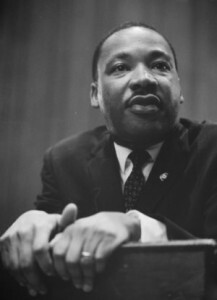 The speeches, sermons, and strategies of the Civil Rights Movement were in large part shaped by the vibrant ideas King wrestled with during his education at Morehouse College, Crozier Seminary and Boston University. The books he read and the scholar-activists he was inspired by shed a different light on King’s works and legacy. Those thinkers on King’s bookshelf were also themselves activists for justice, peace, and equality. As we celebrate King’s life and rededicate our own commitments to justice, come hear what these “mighty streams” have to teach us for our own struggles. 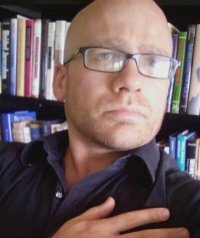 Elliot Ratzman is a visiting professor in the Religion Department teaching courses in the modern philosophical, political and ethical dimensions of religious traditions. Since college, Ratzman has been involved with movements for economic justice, Middle East peace, and human rights. He is finishing a memoir on academics and activism in Israel called “After Zion” and writing a monograph about the genre known as “immersion journalism” where journalists experiment with living for a time as “the Other” as in the classic Black Like Me and Nickel and Dimed. Ratzman’s course, “Religious Radicals: The Theological-Political Martin Luther King Jr” is the basis for a book project on King’s intellectual influences. Contact him at elratzman@gmail.com. With King Day coming up, we wanted to share this announcement that was circulated on the faculty-staff list today. Jan. 20, 4 to 7 p.m., YWCA, 4 E. 7th Street in Chester. The YWCA and Tau Delta Omega Chapter will host a Sunday Supper and Movie event. This fun event will include food, conversations, games, prayer and a presentation of the film “Half the Sky.” Reservations are encouraged; call (610) 876-2222. Stuffing of bags filled with personal care items for area needy. Collaborative art project: Led by representatives from the Community Arts Center of Wallingford, children and adults will color individual quilt squares that we will assemble on the wall in a collaborative design celebrating King’s connection to Chester. Presentations about safe medication use, financial management and gun violence prevention. Quilting, bib-making and dress-making for people in Haiti (sewing experience needed). Jan. 21, 1 to 4 p.m.., YWCA, 4 E. 7th Street in Chester: Children can enjoy a special “King’s camp” filled with a variety of fun activities, including a virtual tour of Chester, a movie, crafts, museum tour, snacks and more. Cost is $2. Jan. 21, 1:30 p.m., Old Main Building at Crozer-Chester Medical Center, One Medical Center Boulevard, Upland: A wreath will be laid in front of the site of the former Crozer Theological Seminary, where King earned his Bachelor of Divinity in 1951. Rev. Dr. Bayard Taylor, pastor of Calvary Baptist Church (where Dr. King worshipped while he was a student), will deliver brief remarks. Jan. 21, 2 to 2:45 p.m., Clark Auditorium at Crozer-Chester Medical Center, One Medical Center Boulevard, Upland: The public is invited to a celebration that will include speeches and musical performances. 6:30 p.m., Alumni Auditorium, Widener University, 14th and Walnut Streets: Widener’s annual commemoration of Dr. King’s life, sponsored by the University’s Black Student Union. The program will include reflections from members of the Widener community about the significance of King’s life and work. Since 1994, the Martin Luther King Commemorative Committee has worked to honor the memory and legacy of Dr. King in Chester, where Dr. King studied and preached before emerging as a civil rights leader on the national scene. As such, this holiday has always had a special meaning for Chester residents. In fact, it was the first community in Southeastern Pennsylvania to have a day of service on the holiday honoring Dr. King. Organizations involved in the planning and funding of the events include the United Way of Greater Philadelphia and Southern New Jersey in Delaware County, Widener University, the Chester YWCA, the Community Arts Center, Swarthmore College, Eastern University and Crozer-Chester Medical Center. For more information about events at the YWCA, call (610) 876-2222. For more information about Widener’s participation and the evening event at the University, contact Marcine Pickron-Davis at (610) 499-4566. For more information about the event at Crozer-Chester Medical Center, contact Grant Gegwich at (610) 447-6316. Pathways PA will be collecting food for families in crisis at the Center for Families, a residential facility for women and families transitioning from situations of homelessness and abuse. Cereals, snack foods and non-perishable items are being collected through January 21, at PathWays main office at 310 Amosland Road in Holmes. For more details, call Josh Glickenhaus at 610-543-5022. The Delaware County Historical Society (DCHS) will present the first-ever Black History Parade in Chester on Saturday, Jan. 26th to celebrate the legacies of Dr. Martin Luther King, Jr., a former Chester resident; and Chester Clippers basketball. It also kicks-off its Black History Month exhibit. Avenue of the States in Chester, will be followed by a special program celebrating the grand opening of the exhibit that runs until March. The parade will feature members of the PA Buffalo Soldiers on motorcycles; re-enactors of the Civil War-era 3rd Regiment U.S. Colored Troops; Noah Lewis, the re-enactor of the Revolutionary War hero, Ned Hector; and locals including Kollective Talent Drill Team and other organizations. Following the parade, the program inside the museum will feature singer Pam Gordon, the Gospel Disciples of Chester, an African dance presentation by Monika Rhoades and presentations from the Buffalo Soldiers, the Chester Clippers and others. 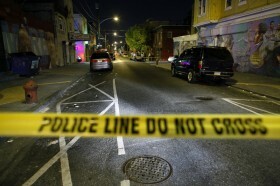 In the wake of the Newtown, CT shootings and a renewed national conversation over gun control, “Peace Studies and Action” PEAC 077 will partner this spring with GunCrisis.org, an open source reporting community developed to address the epidemic of homicide by gunfire in Philadelphia through online journalism and social media. Peace Studies and Action aims to bridge the gaps between peace research, theory, and implementation by encouraging students to move between each as we study nonviolent ways of conducting conflict and the challenges of developing and sustaining effective peace work, like GunCrisis.org. Emphasis is placed on getting close to the experience of peacemakers and activists by reading autobiographical writings, visiting local peace organizations, and/or dialogue with invited guests. As a class, we will collaborate with GunCrisis.org to contribute to the work of the organization while developing our own research skills. Discussion over course readings and exploration of peace studies literature will also be emphasized. This course will encourage collaboration and active participation in delivering the content of the course. The pre-requisite of PEAC 015 Introduction to Peace and Conflict Studies has been suspended, so the course is open to all students. 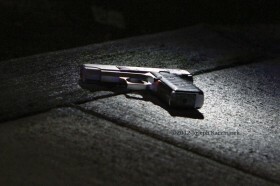 For a brief introduction to the problem of gun violence in Philadelphia, view this short video by Jim MacMillan, a founder of GunCrisis.org and Journalist in Residence at Swarthmore.